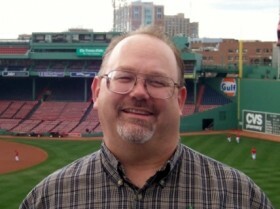 At Fenway Park in Boston getting ready to watch the Red Sox. My name is Michael Reaves and I am the pastor of Fletcher’s Chapel Church and excited to be part of this church family. Let me share a little of my own story. I am a lifelong Methodist and native of Virginia. I grew up in the small town of Altavista, VA which is about 30 minutes south of Lynchburg down US-29. I was baptized and confirmed at Lane Memorial United Methodist Church in Altavista. While attending the University of Virginia, I met my wife, Susan. We are the proud parents of two adult daughters – Michelle and Rachel. Before answering God’s call to ministry, I worked for Domino’s Pizza as a store manager in Charlottesville, VA and, later, as an area supervisor for seven stores in Roanoke, VA. I left the restaurant business and went to work as a branch manager in the consumer finance field where I ran offices in Richmond, Suffolk, Elizabeth City, NC and Chesapeake. My wife and I were members of Oak Grove United Methodist Church in Chesapeake, VA when we both heard God’s call on our lives. After much prayer and counsel, Susan and I sold our home, quit our jobs, and moved to Madison, NJ where we both enrolled in Drew Theological School in August 1996. After graduating from seminary in May 1999, we moved back to Virginia to serve our first appointments in the Roanoke, VA area. After five years serving as pastor at Mount Pleasant United Methodist Church in Roanoke, I was sent to Monumental United Methodist Church in Emporia, VA and then to Saint Andrew’s United Methodist Church in Portsmouth, VA before coming to Fletcher’s Chapel on June 27, 2012. Susan currently serves as Pastor of Trinity United Methodist Church in King George, VA. I invite you to come and be a part of our community. There are many opportunities here for you to be nurtured in the faith. Join with us as we work to grow in faith together and reach out to the community and world around us.